We have 1st Class en-suite and budget accommodation which is newly refurbished. 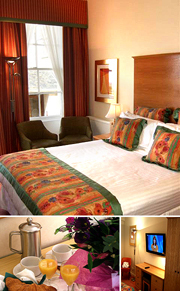 Each room has a colour TV, tea/coffee making facilities, hairdryer, clock radio. Recently given the taste of Scotland Award for 'consistently demonstrating a commitment to excellence' Using fresh local produce our chefs cook up a wonder every night. Be it a full gourmet dinner or just snacks and suppers you'll never go hungry here. Add to this our wide range of wines and spirits and your sure to have a real culinary feast from breakfast through lunch to dinner. Whether your stay in The Horizon Hotel for business or pleasure, our delightful family run Hotel is sure to have a well-equipped room for you. All rooms have en-suite shower and / or bathrooms. A lift to all floors is provided to assist the elderly or guests in wheelchairs, with two ground floor rooms especially equipped for the disabled with wider doorways, ramps, grab rails and a bath lift. Our family rooms are spacious and, if desired, we can provide complimentary cots and high chairs. Sleep in comfort in our new pocket sprung queen sized double beds. Sleep late if you want, as all our curtains have blackout linings, or rise early and enjoy a full cooked Scottish breakfast. All our rooms are equipped with freeview, so you don't have to miss your favourite TV shows when you're away andÂ our newly refurbished rooms have large flat screen televisions. We also offer the latest wireless broadband internet technology giving access to the internet, email and corporate networks securely, from anywhere in the hotel, so you can be sure to feel like this Hotel is a home away from home. Enjoy a relaxing breakfast in our Glasshouse restaurant overlooking the sea, or for those of you who wish to lie in, you can take advantage of a continental breakfast with room service which is sure to kick start your day.